The federal Food and Drug Administration finally announced that Triclosan, a toxic chemical ingredient associated with hormone disruption in humans, will no longer be allowed in antibacterial hand soaps or toothpaste! As is with most chemical agents found in our environment including medications and vaccinations, the dangers of triclosan have been known for quite some time. Unfortunately, the Toxic Substances Control Act (TSCA) of 1976 (1) allowed for all chemicals in use prior to 1976 to be grandfathered in. 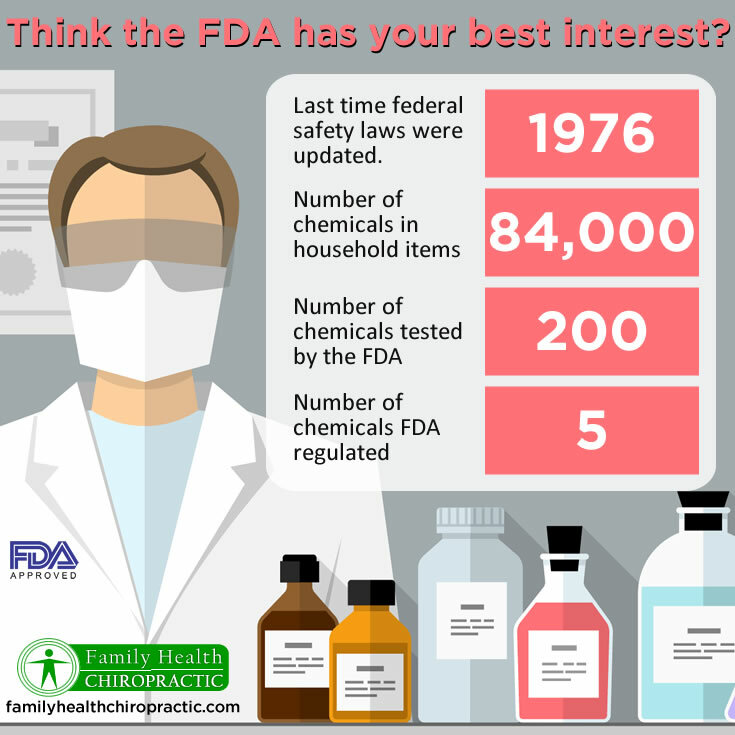 In fact, the U.S. Environmental Protection Agency (EPA), which enacted the TSCA, grandfathered approximately 60,000 chemicals that hit the market in the 70’s. Making matter worse, the EPA only tested a few hundred and deemed only a handful (literally 5) to be semi-regulated. There are now over 80,000 chemicals on the market that have never been tested by the EPA, yet are deemed “safe to use” in products (2). CDC research on a broad cross-section of the population detected triclosan in the urine of 75% of 2,517 Americans (3). Higher levels of triclosan were typically found in higher income participants and an earlier study by the Mount Sinai School of Medicine found triclosan in the urine of 61% of 90 girls age 6 to 8 (Wolff 2007). Triclosan is Some Nasty Stuff and It’s in Toothpaste, Soap and Even Breast Milk! Lab studies have linked triclosan to cancer (4), developmental defects (5), and even impaired muscle function! (6). A study by Colgate scientists revealed exposure to low levels of triclosan caused liver tumors in mice. Colgate refuses to release this study to EPA for evaluation, though it provided it to FDA in order to ensure it could add triclosan to toothpaste and other oral care products. Still, based on the study summary alone, and using a controversial assumption about the way this type of liver tumor forms in mice, EPA classified triclosan as “not likely to be carcinogenic to humans”. How’s your thyroid functioning these days ladies? A study showed that triclosan hinders a fundamental thyroid hormone signaling mechanism (7,8). Triclosan may also disrupt other critical hormone systems. A recent lab study found the chemical to exert both estrogenic and androgenic effects on human breast cancer cells (9). Do you suffer from allergies? Triclosan exposure leads to the development of allergies, especially a problem with children. 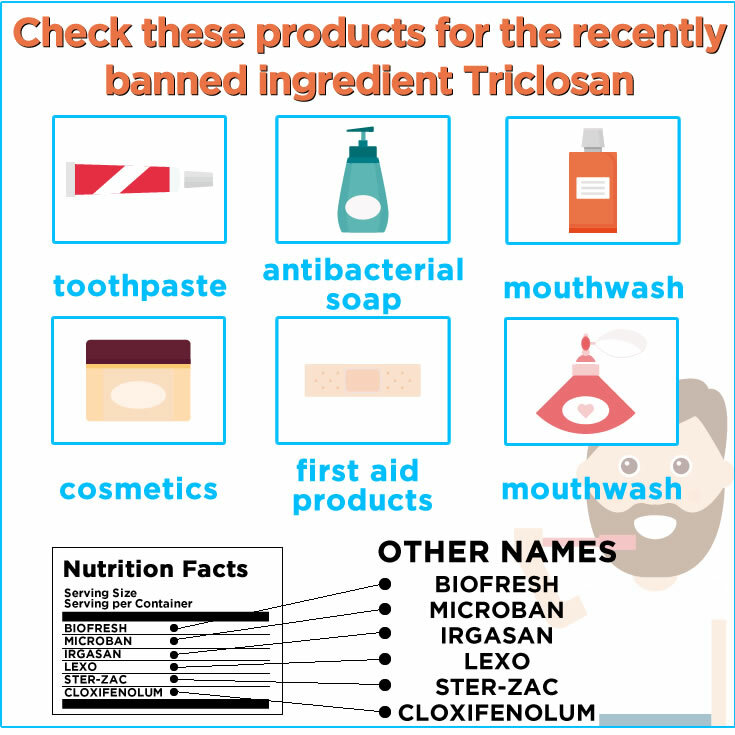 If you or your child suffers from hay fever, asthma, seasonal allergy symptoms or food intolerance, you should have a big concern with using products that contain triclosan! A 2013 Norwegian study looked at the effect of triclosan on 10-year-old children. The study found that triclosan concentrations in urine samples were associated with allergic sensitization, especially inhalant and seasonal allergens, rather than food allergens. The study found that triclosan levels measured in urine were associated with elevated levels of immunoglobulin E and rhinitis (blocked nose/hay fever) in the 623 children studied (10). Soap: Dial® Liquid handsoap and bodywash; Tea Tree Therapy™ Liquid Soap; Clearasil® Daily Face Wash; Dermalogica® Skin Purifying Wipes; DermaKleen™ Antibacterial Lotion Soap; CVS Antibacterial Soap, Ajax Antibacterial Dishsoap, Kimcare Antibacterial Clear Soap, Bath and Body Works Antibacterial Hand Soaps, Gels and Foaming Sanitizers. What Else Have you Been Told is Safe But is Not? True, the FDA’s decision to ban Triclosan marks another important victory for the tens of millions of shoppers who are health conscious, but what other consumer products or “health campaigns” (ie mass vaccination campaigns, antibiotic usage, statin medications) will turn out to be nothing other than human experiments gone wrong? If there’s anything to learn from this, it’s that history does tend to repeat itself and it should be obvious that our “health” is typically not in the best interest. Within 26 seconds after exposure to chemicals such as those found in cleaning products , traces of these chemicals can be found in every organ in the body. Over 80 percent of adults and 90 percent of children in the United States have residues of one or more harmful pesticides in their bodies. There is no current law that requires cleaning product manufacturers to test their products for safety or even list toxic ingredients. Rather, it’s opposite. The ingredients are safe guarded against public knowledge because they are classified as “trade secrets” in the industry. Don’t wait for the FDA to finally admit that something is bad for you. When it comes to safe guarding your body, logic is really all you need. There is no chemical on the planet that can ever be good for you. Take the initiative to protect your health and use the following suggestions to create your own cleaning agents that are safer and less toxic. 1) Avoid any and all products that are labeled “dangerous, hazardous or poisonous”. These products are not only bad for you with direct skin contact, but likely emit vapors and/or leech into your cabinets (especially if they’re in plastic containers!). 2) Avoid any product that does not provide a complete ingredient list. 3) Avoid any products that are petroleum-based surfactants, contain chlorine, formaldehyde or phosphates. 4) Seek out those products that are labeled “non-toxic” and “biodegradable”. In fact, I’d take the time and spend the money to purchase cleaner products from stores such as Whole Foods, Central Market or Sprouts. White Distilled Vinegar: White distilled vinegar has been used for more than 10,000 years. This amazing all-purpose cleaner is inexpensive and is a strong deodorizing tool. Vinegar also acts as a powerful home insect repellant. Lemon Juice: Lemon juice contains a high amount of alkaline elements. A highly acidic substance, lemon juice has a pH of 2 when not broken down and outside the body. Its primary component, citric acid disinfects and cleans while providing a natural lemon fragrance. Baking Soda: A natural alkaline substance, baking soda is a sodium bicarbonate. A natural odor eliminator, baking soda neutralizes both acids and bases. Unlike synthetically produced odor “eliminators”, baking soda actually does eliminate odors rather than adding more chemicals into the air which only cover up smelly scents. Baking soda also can be used to remove stains from surfaces as fragile as fine china. When used as an abrasive tool, baking soda can be scrubbed on sinks, countertops and other surfaces. Citrus Seed Extract: Citrus seed extract is analogous to the properties of lemon juice. Typically made from grapefruit seed, citrus seed extract functions as a natural preservative and a strong antimicrobial substance. Essential Oils: Essential oils are extracted from raw plant materials like flowers, bark, wood, root, seeds and peels. They act as some of the most powerful antioxidant concentrates and have medicinal qualities when properly used. Essential oils serve as powerful antimicrobial disinfectants. With concentrated essential oils, a little goes a long way and are in fact a highly economical way to slash your cleaning budget. 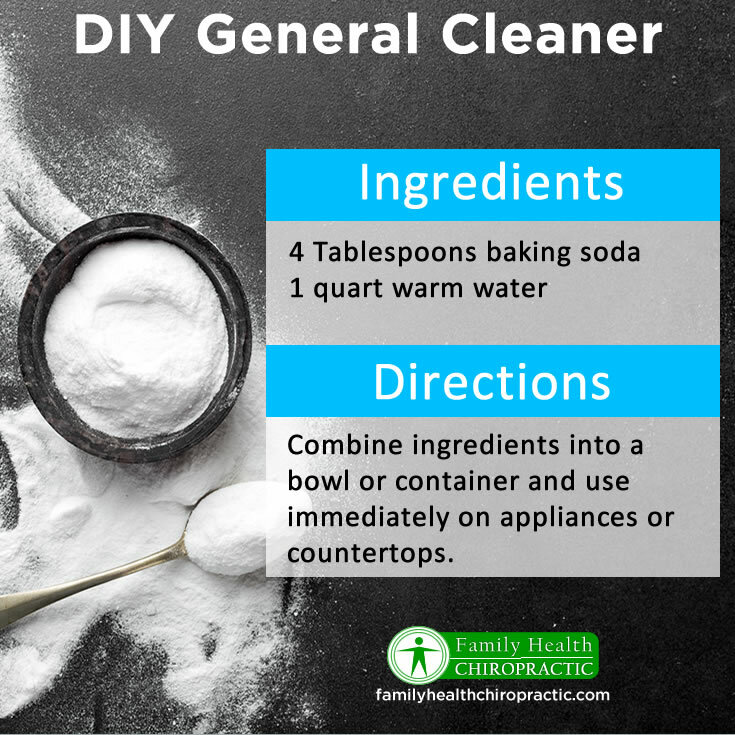 For a general cleaner to use on grime and soil build up mix 4 tablespoons of baking soda with a quart of warm water. Combine the ingredients into a bowl and use immediately on your appliances. You can also spray on your prepared cleaner and allow to set for several minutes. Using a metal spatula or metal brush to clean the grill or scrape the bottom of an oven, rake away the burnt debris in one swift motion. 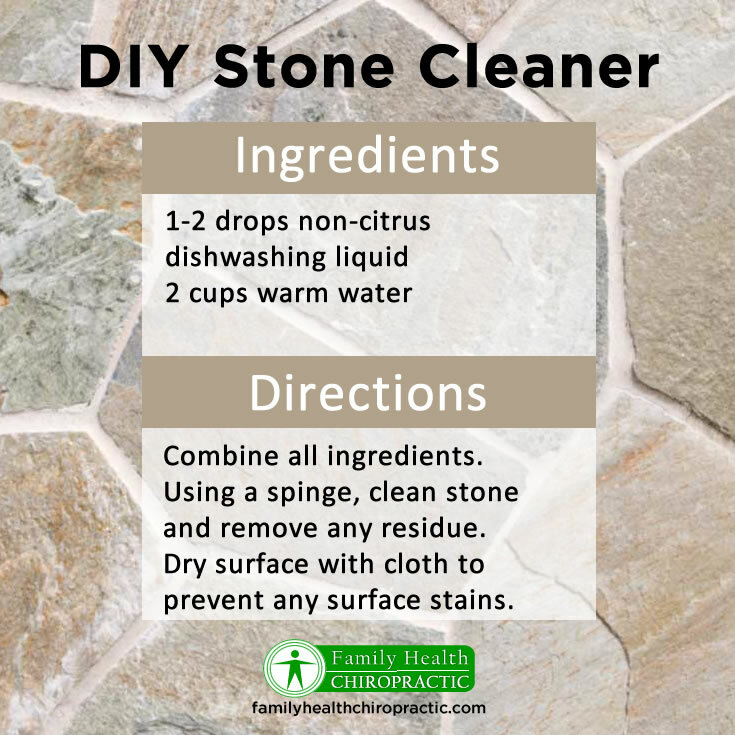 Never use an acidic cleaner on a natural stone surface. The acid will actually eat away at the stone. 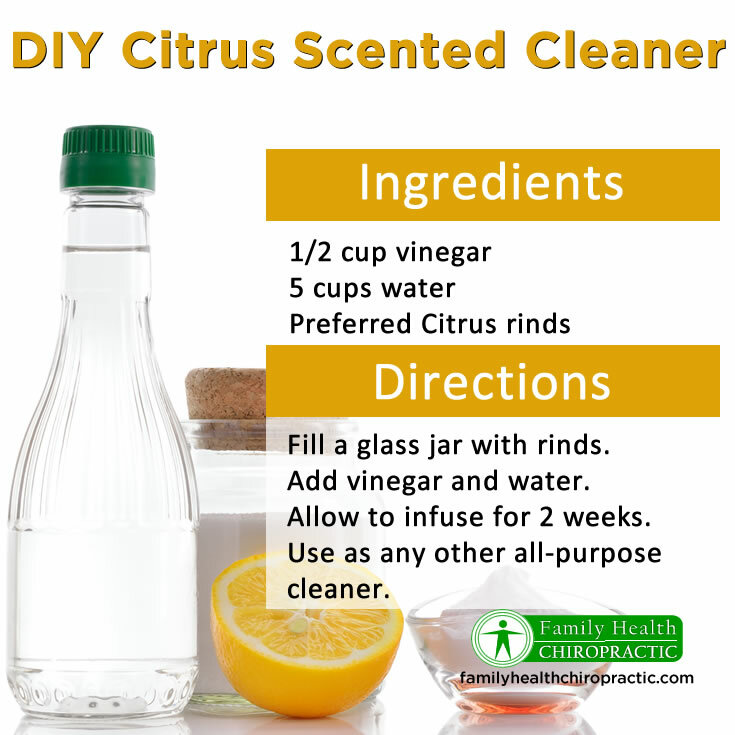 Use your non-citrus dishwashing liquid to create this cleaner. Mix 1-2 drops of non-citrus dishwashing liquid with 2 cups of warm water. Combine all the ingredients together and use a sponge to clean the stone surface. Finally, make sure that you dry the surface with a clean cloth to prevent any staining. Vinegar is one of the best multi-surface cleaners. Keep all of your leftover citrus peels from oranges, lemons or limes and save them for this all-purpose spray. Take 1/2 cup of vinegar, 5 cups of water and a handful of your preferred citrus rinds. Put all the ingredients into a glass jar and let it infuse for about 2 weeks. Use this spray as you would any other all-purpose cleaner. This is an easy glass cleaner recipe for streak free windows and mirrors. Be sure to avoid cleaning heated glass surfaces such as windows on a sunny day or the glass door of a warm oven. The heat will increase the likelihood that your solution will dry too quickly leaving streaks left behind. To prepare, take 2 cups of water, 1/2 cup of white vinegar, 1/4 cup rubbing alcohol and 2 drops of your preferred essential oil (orange, lemon, eucalyptus) and combine all the ingredients into a spray bottle. 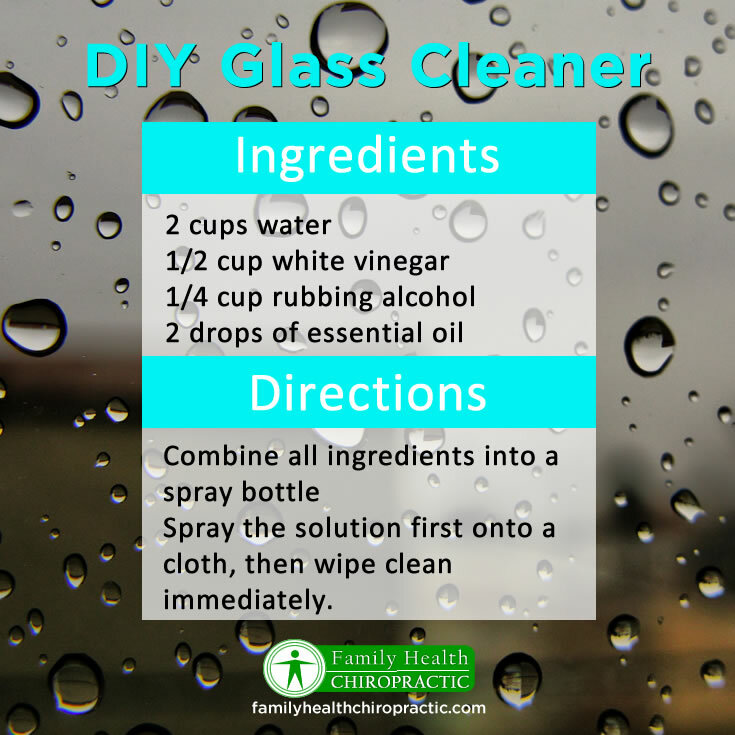 Spray the solution first onto a cloth or paper towel and not directly onto the glass surface. Wipe clean immediately. If you still prefer to purchase your cleaning products rather than make them yourself, here are a few products you can have shipped to your door from Amazon.